Trailers of all kinds that are able to be towed by a car or 4WD, such as horse trailers, builders trailers or catering trailers, are extremely convenient for getting from one place to another. However, there are times when you need to have a car trailer relocated and for whatever reason, you simply can’t move it yourself. Whether you need someone to tow the trailer for you or you need to have it floated on the back of a truck or car carrier, you can find an experienced and dedicated trailer transporter with the right vehicle and equipment to move your specific trailer freight. Get quotes for car trailer transport today! Get 3 Quotes for transporting trailers. It’s free to request quotes. Builders Trailers: Builders trailers are generally higher than a standard trailer and, therefore, they will be a bit more challenging to load and unload. However, you can find carriers with experience in relocating these types of trailers. Caged Trailers: If you’ve purchased a new or used caged trailer interstate or locally and you can’t get there yourself, then there are car trailer transport companies across Australia who move caged trailers door-to-door in regional and metropolitan areas, as well as interstate. Tandem Trailers: A tandem trailer is one of the most common trailers we see on Australian roads. However, we can’t always move them ourselves and need to enlist the services of a car trailer transporter to tow the tandem trailer for us or float them on the back of a truck. Fuel Trailer: Fuel trailers can be bulky and need to be handled with a degree of care. Whether you need the fuel trailer shipped interstate, regionally or through metropolitan areas, you can find a reputable trailer transporter to do the job for you. Horse Trailer: If you need to relocate a large horse trailer or a smaller horse float, then you’ll need to find a professional and reliable trailer transporter to ensure that your horse trailer or float is handled with the utmost care. Boat Trailers: If you’ve made an interstate purchase for a new boat trailer and you need to get it home, anywhere across Australia, then you’ll need to find a reliable boat trailer transporter who is capable of carrying that type of freight. Gooseneck Trailers: If you’ve had a goose neck trailer custom made or you’ve just made a new purchase and need it relocated, then you’ll require the services of a truckie with the right vehicle and equipment to carry a longer trailer freight. Yacht Trailer: If you need to relocate your yacht, or you just want a trailer in case it’s required in the future, then you will need to get a yacht trailer. If you’ve made a purchase and need to get it to the marina, then you can find a trailer transport company to move that for you. Jetski Trailer: A jetski trailer is lighter and, therefore, trailer transport companies with lighter rigid trucks would be able to take this type of freight. A 4WD can also be used if you specify that you are happy for the jetski trailer to be towed. Dog Trailer: Dog trailers can be carried on a larger car carrier trailer and transporters with these trucks will usually take the dog trailer as a part load with other cars or trailers going to a similar pickup and delivery location. Coolroom Trailer: Coolroom trailers are moved across the country due to new coolroom trailer purchases or an existing business moving interstate. The height of the coolroom trailer should be taken into account when the freight is shipped by the trailer transporter. LED Display Trailer: LED display trailers are often moved for events, races and festivals. If it’s just the trailer you need relocated with the screen removed then it’s a fairly simple process but if the LED screen needs to be moved with the trailer then this becomes a more delicate operation. Lighting Tower Trailer: Lighting tower trailers are regularly utilised for events and are a great way to provide mobile lights. When it comes time to move from event to event, you’ll need to find a reliable and dependable carrier in order to relocate the lighting tower. Compressor Trailer: Compressor trailers are one of the heaviest trailers that are shipped interstate and in metropolitan areas. As they are wheeled equipment, they’re able to be winched onto a truck’s trailer or onto a car carrier. Box Trailers: If you need a box trailer delivered either door-to-door or depot-to-depot, you can find capable and registered car trailer transport companies who perform these types of trips for customers on a regular basis. VMS Board Trailer: Variable Message Signs (VMS) or Trailers can be moved by towing them at the back of a Ute or 4WD or floating on a truck. If you need to move a VMS board trailer, then specify if it is fit to be towed to get the right car trailer transporter. Service Trailer: Industry-specific service trailers can be designed for civil, mining and commercial operators and each individual pickup and delivery location will come with its own specific requirements for the trailer transport company. 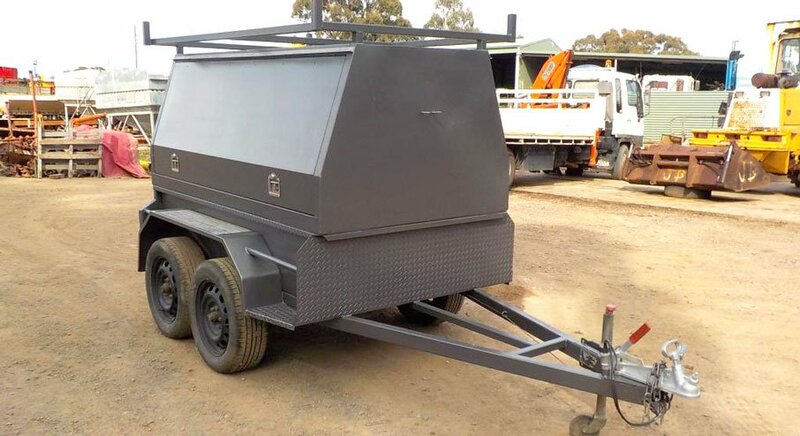 Job Site Trailer: Either very large for big construction and mining sites or smaller site trailers designed for builders, job site trailers can be towed or if required they can be loaded on the back of a flatbed trailer. Traffic Lights Trailer: When collapsed for transport, a traffic light trailer is usually smaller freight compared to other trailers. This is helpful as it means they can be conveniently shipped in loads with multiple traffic light trailers, which is often required. Wood Chipper Trailers: These wood chipper trailers can range from small to extremely large. As sometimes they can’t be towed, wood chipper trailers require a skilled trailer transport company to float them. If able to be towed, you can specify this to get the right transporter. Catering Trailer: Food vans or catering trailers have become popular amongst patrons and are now commonly the go-to for dining choices. If you’ve purchased a catering trailer for your business or you need it relocated for an event, then a reliable carrier can do that for you. Promotional Trailer: These trailers are often shifted to sporting events and music festivals and set up on site to sell merchandise. If you need to get these to the event then finding the right car trailer transport company to tow that for you is essential. Tent Trailer: A tent trailer includes a standard box trailer that can be lifted out into a tent. For larger tent trailers, you can list them under the caravan section to ensure you are being contacted by the right car trailer transporters. Car trailers, yacht trailers and promotional trailers are moved across Australia through regional, local and interstate areas for a number of reasons and, therefore, there is a common need to find capable individuals and companies to transport these trailers. With FreightQuotes, you can submit a free request for quotations through our online portal and we’ll connect you with ABN registered transporters who are able of carrying your trailer. Up to three of these car trailer transporters will then contact you with costs and rates and you choose the right one for you. Car trailer transport is available Australia wide. This includes interstate, regional and metropolitan freight covering all states and capital cities including Adelaide, Brisbane, Perth, Darwin, Melbourne, Canberra, Hobart and Sydney.